I scored a great deal on a Kappasphere rack for my Solstice. Since my Wife has luggage issues, this will make top-down roadtrips possible. This was the best $100 that I've ever spent on this car! nice - but don't put TOO much weight on it. Looks like one of the earlier versions. 50lbs is max weight. Maybe... 49lbs MAX. I'll have a talk with my wife. Any idea what the other versions look like and what the maximum weights would be? Great photo and this looks exactly like the Cabrio Supply rack. 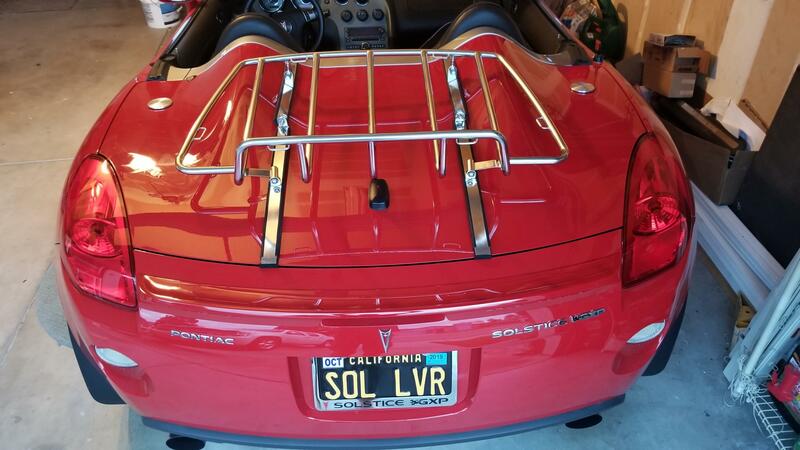 Check their website here for Solstice/Sky/Opel GT rack. https://www.cabriosupply.com/luggage...solstice-2007/. Weight limit is 25 Kg or about 55 pounds. The other (later?) Kappasphere rack does not have the flex attachments and is a more solid configuration, otherwise identical. Did you get the mounting instructions with the rack? They are no longer available on line. Great photo and this looks exactly like the Cabrio Supply rack. 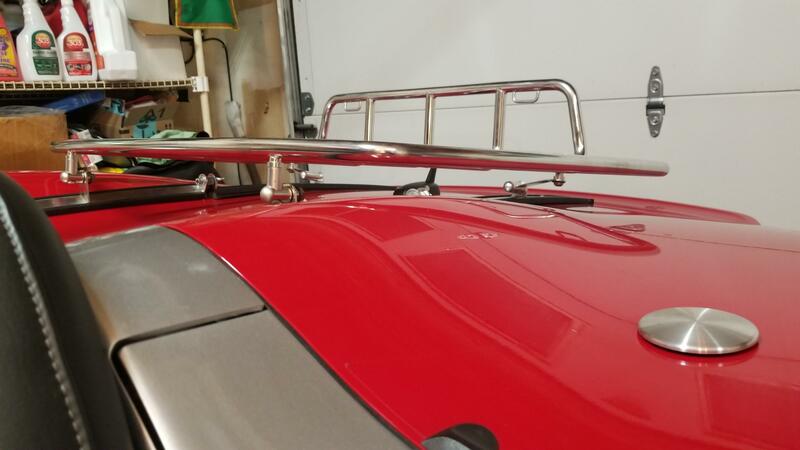 I don't like the look of having the upright part of the rack towards the front and there doesn't seem to be much clearance over the humps... no way it will work with my XM/OnStar antenna. Better than instructions - the seller helped me install it. I will take some pictures before I pull it off for reference. I had expected safety would demand the upright part to be near the humps, and not near the rear like in the photo, in order to prevent people getting severely injured or killed by flying luggage during an emergency stop or collision. I will be using soft luggage at weights less than 50lbs and LOTS of straps! The later versions had more upright brackets with more clearance above the trunk lid. 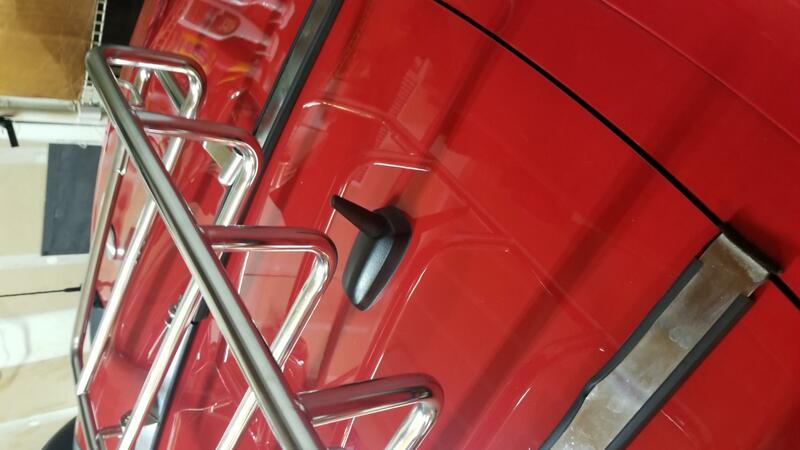 The distance between the brackets that attach it to the trunk are also slightly narrower at 12" apart. I believe the weight limit was unchanged. Life is full of priorities. Judy and I made a 5-day trip, brought back a case of wine, and were still able to put the top down. It can be done. My wife and I drove 10,550 miles during an eight week period 5 years ago. Drove from Florida to Nogales. Then drove US 89 to the Canadian border, across to Washington, down the Pacific Coast hwy to Santa Barbara, across to the Grand Canyon and back to Florida. We packed judicially, no luggage rack. Many of the miles were with the top down. Weather was hot, hot, hot in the desert to snow at the Canadian border. Enjoy your ride. It will be a lot of fun  . Greatgab and Rphillips66 like this. Was the case of wine on the luggage rack, or was Judy? Cause there's no way a case of wine is fitting in the trunk. Neither. It wasn't still in the case, but was 12 bottles. Also, I don't have a luggage rack.